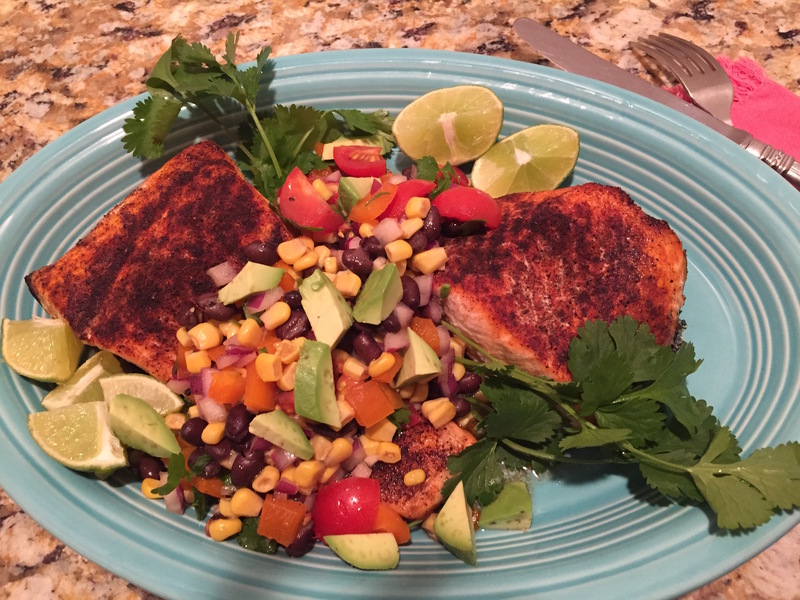 Smother the Chili Rubbed Salmon with the Black Bean Salad for a flavor packed dish! Chili Rubbed Salmon sounded so good as I was planning our family dinner tonight. I’m still feeling the holiday overload so a healthy recipe was very appealing. The Black Bean Salad was a perfect choice to add interest and depth of flavor to this meal. I surprised the family with this colorful, eye-popping presentation. They loved it. Heat a large non-stick skillet over high heat. Add the oil and heat until shimmering. Rub the fish with the chili powder and season with salt. Careful lay fish, skinned-side up in the skillet. Cook the fish turning once until brown, crisp and just firm, bout 3 to 4 minutes on each side. Transfer the salmon to a serving platter and tent with foil to finish cooking, bout 5 minutes more. Smash the garlic clove, sprinkle with a pinch of salt, and, with the flat side of a large knife,mash and smear the mixture to a coarse paste. Whisk the garlic paste, lime juice, salt, and chili powder together in a bowl. Gradually whisk in the olive oil, starting with a few drops and then adding the rest in a steady stream. Cook the corn, bell pepper and onions in the olive oil until beginning to brown over medium-high heat in a skillet. Toss in the black beans and cook until warm. Add the dressing and toss to coat evenly. Adjust seasoning with salt and pepper. Remove from heat and gently fold in the tomatoes, avocado and cilantro. Serve and ENJOY! Note: I prepared my salmon by rubbing the chili powder on my 2 12 ounce fillets. I then poached them in the oven. It was delicious! The Chili Rubbed Salmon recipe comes courtesy of Nancy. She is a good friend of Arthritis Wisdom. I really appreciate my dear friends that have insight and interest in the sensitivities of living with an autoimmune disease. I’m having a hard time getting back into my normal grove after a season of indulgence! I couldn’t help myself when getting together with family and friends. I value relationships so much and was so thankful spending time with the precious people in my life. This year I consistently went overboard when snacking and celebrating. Once I lose the discipline, it is all over! That is why I needed a delicious and healthy dinner the Chili Rubbed Salmon and Black Bean Salad provided. My body tells me when I’m not eating well or if I’m eating too much. My legs feel “spongy” or “gummy” and my knees hurt when I climb the stairs. It sounds bizarre, but I’ve learned the signs that I need to get back on track to prevent problems, such as an arthritic flare. I can focus on other things during the day, but at night when I’m trying to fall asleep my body speaks loud and clear. I will be chronicling my return to pre-holiday normal as I think this is an issue others probably come up against. I would welcome any comments or suggestions from you concerning your tips or tricks to get back to normal. Just leave a comment! Go ahead and surprise someone with this tasty dish! The time is now for a heart-to-heart chat about RA and Cardiovascular Disease! It is time for a heart-to-heart chat about rheumatoid arthritis (RA) and cardiovascular disease. Cardiovascular disease tops the list of serious complications people with RA suffer. Eric L. Matteson, M.D., chair of the Division of Rheumatology at Mayo Clinic in Rochester, notes that people with rheumatoid arthritis have a 50 percent higher risk of heart attack, twice the risk of heart failure and more peripheral vascular disease than people who don’t have rheumatoid arthritis. These statistics and my participation in a cardiovascular research study inspired a personal call-to-action! I will explain. In addition to aggressive pharmacotherapy, I have made major healthy lifestyle changes with very favorable results. It didn’t happen all at once, it has been a process. My goal is to move toward a great quality of life that, of course, includes good disease management. The process hasn’t been instant pudding or perfect, but after several years the two-steps-forward-one-step-back dance has netted a control of RA symptoms I’m satisfied with. I hit my target! I realize my disease management success today does not guarantee success tomorrow, so I must be vigilant and wise. Hence, I’ve committed to increasing my Arthritis Wisdom! The right medication and the right dose, which did take years to figure out, are only part of my management plan. Healthy habits are the rest of the story. I am continuously refining my healthy lifestyle in five different areas. In fact, I created an acronym, FRESH to keep it simple. Let me share my FRESH life story. F for Food I read a lot about the anti-inflammatory diet and was basically overwhelmed by all I should and should not eat. So I settled on cutting out processed food and limiting added sugars and salt. Any product with a multi-syllable-chemical-type name in the ingredients list was a no go. I’m a foodie and love to cook, so it was easy to cook with fresh fruits, vegetables, seafood, poultry, nuts, seeds, herbs, spices and a few whole grains. R for Relaxation or Stress Reduction I’ve made the hard decisions altering my professional career in order to place my health first. The stress reduction has made a dramatic difference in my disease management. I also meditate often and am very careful with my schedule. I do not over commit. E for Exercise I do a 50-minute pilates session every week, walk my dog 2 to 3 miles most nights and, this is fun, I just started tap dancing once a week. We will see how that goes. The thought is to strengthen the muscles in my legs and feet. Swimming would be a great activity, also. S for Sleep I aim to get 8 hours of sleep every night. I use what we call in the pharmacy world, good sleep hygiene. No caffeine after 2 in the afternoon and a nightly routine to wind down. H for Hydration The nutritionist suggested to take your weight in pounds, divide that number in half giving you the ounces of water to drink daily. FRESH is a quick and easy reference to use when I am just not feeling up to par. A rundown through the letters helps me assess if any slacking in any of the five areas is happening to perhaps cause the soreness or fatigue or any other RA symptom. Making the effort to “know your body” has been extremely beneficial for me. 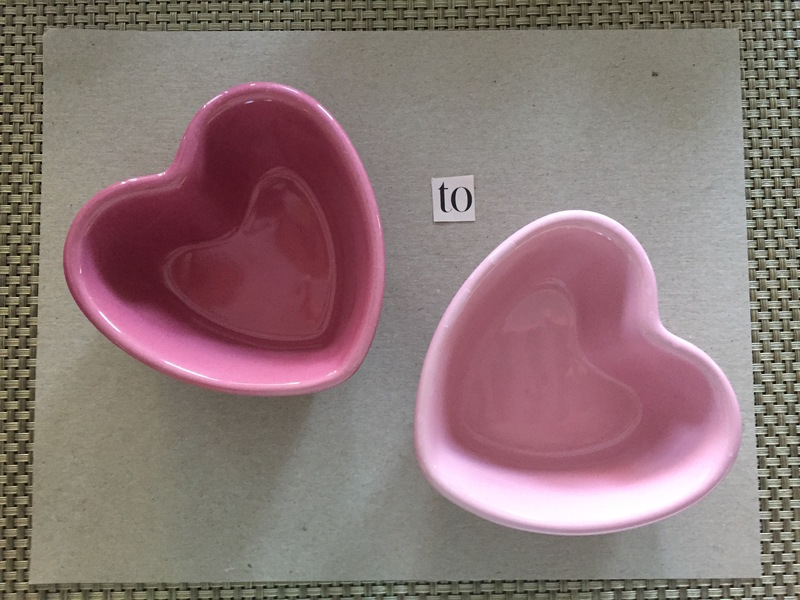 We are all unique and the disease expresses itself differently in each individual, so we each need to listen to our own body to pick up on what it is telling us. It is then up to us to respond. Hopefully, the FRESH acronym can be used to jump-start building a personal healthy habit campaign for you to not only help manage the RA but help prevent comorbidities such as cardiovascular disease. I am compelled to address smoking because it is a big deal. It is a risk factor for RA and heart and vascular disease. Smoking cessation is so critically important. There are numerous products available to help you. Your doctor and/or pharmacist would be delighted to discuss the options. The mechanism(s) of how and why people with RA have an increased cardiovascular risk are not known at this time. What is known is that heart and vascular disease is significantly more prevalent in the RA population. For this reason, heart-healthy lifestyle choices need to be a part of the conversation from the time of diagnosis. And that is using Arthritis Wisdom! What are your thoughts and ideas on this important subject? We would LOVE to hear them all. Thanks for the heart-to-heart chat. Come visit us again, soon!